Woah, woah, woah. We don’t want you to incur the wrath of the IRS, but most mission statements are simply not enough to drive high performance and guide you to your intended impact. A useful, high-quality mission statement “focuses the organization on action. It creates a disciplined organization.” It “sets out the reason for the organization’s existence and drives programs and services, operational goals, and day-to-day activities.” But because most mission statements are also used for legal purposes, marketing, and promotions, they usually end up as an inspiring catchphrase on a t-shirt, not a clarifying statement of the organization’s purpose or ultimate impact. Alternatively, mission statements are also often created by a committee to offend no one—in other words, designed to be broad, wordy, and practically meaningless. For example, can you guess whose mission statement this is? We will strive to integrate virtual educational opportunities in order to competently operationalize impact to the highest standards. In truth, it was created by the Mission Statement Generator, which recombines nouns, verbs, and adjectives into prototypical and jargon-filled mission statements. Admit it: for just a second, you thought it was real. So, if a mission statement isn’t a true “North Star” and doesn’t provide the guidance you need for making tough decisions, what’s a leader and strategic thinker to do? We at Blue Garnet believe an Impact Statement is the best tool to create focus, drive clarity, and help you to become a high performing organization. An Impact Statement defines in one sentence how the world is different in ten years because of your organization. 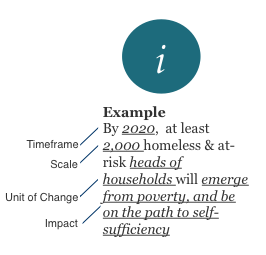 It includes a scale, timeframe, unit of change, and clear impact, to drive operations and galvanize action. The best Impact Statements incorporate a big, hairy, audacious goal (BHAG) and answer the question “so what?” for your organization. Are you ready to “ditch your mission statement” and take accountability for results to a new level with an Impact Statement? Light, Mark. Results Now for Nonprofits: Purpose, Strategy, Operations, and Governance. Hoboken, NJ: John Wiley & Sons, 2011. Print. O’Connor, Judith. The Planning Committee: Shaping Your Organization’s Future. Washington, D.C.: National Center for Nonprofit Boards, 1997. Print. How is an impact statement different from a vision statement in your view?